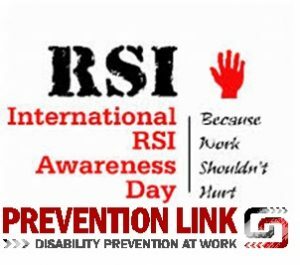 (TORONTO, ON) ─ On this Repetitive Strain Injuries (RSI) Awareness Day, Ontario Federation of Labour’s Prevention Link urges all Ontarians to recognize and support the many workers who fall victim to one of the most common types of injuries in the workplace. Repetitive Strain Injuries are one of the most common types of injuries in the workplace. RSI’s or musculoskeletal disorders (MSDs) painfully effect muscles, nerves, and joints in the neck, back, chest, shoulders, arms, and hands. Read the full RSI statement from the Ontario Federation of Labour. Prevention Link is developing its Lighthouse Initiative to serve two categories of vulnerable workers: those returning to work after an injury; and those who may not have been injured, but have limited knowledge of occupational health and safety laws and available resources. Through our work we look to prevent more MSDs workplace injuries. We also encourage all workers to utilize disability prevention principles, which is why the Return to Work (RTW) consulting branch of Prevention Link facilitates a strategic fit with workplace return-to-work best practices and all applicable rights. Prevention Link, which is supported by the Ontario Ministry of Labour’s Prevention Office and governed by the Ontario Federation of Labour’s Executive Committee, is the leading provider of training and advisory support on secondary prevention of workplace injury in the province. For information, visit preventionlink.ca and follow @PreventionLink on Facebook and Twitter. Prevention Link maintains office hours Monday through Fridays from 9:00 a.m. until 4:00 p.m.